Saturday: Hot, partly cloudy. Storm north. Highs in the 80s. Saturday Night: Turning cooler & cloudy. Lows in the 50s and 60s. Sunday: Cloudy, light showers. Highs in the 50s and 60s. 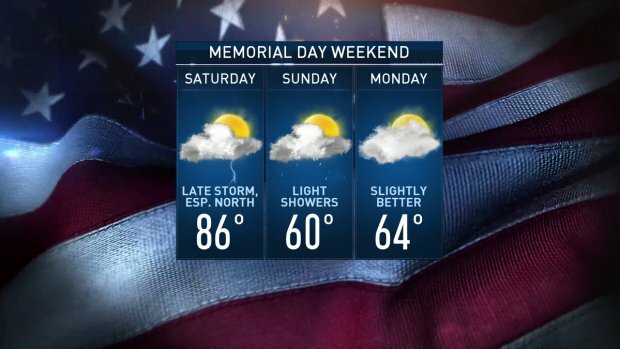 Memorial Day: Mostly cloudy, spot shower. Highs in the 60s. Friday was a warm to hot start to Memorial Day weekend across New England, with highs surging into the 80s to near 90. The same happens again Saturday in parts of southern and western New England, but a front will make a big difference as it passes from north to south. On the south side of the front the wind is from the west 10-20 mph, on the north side of the front, wind is from the northeast 10-20 mph. Along the front we will have thunderstorms. 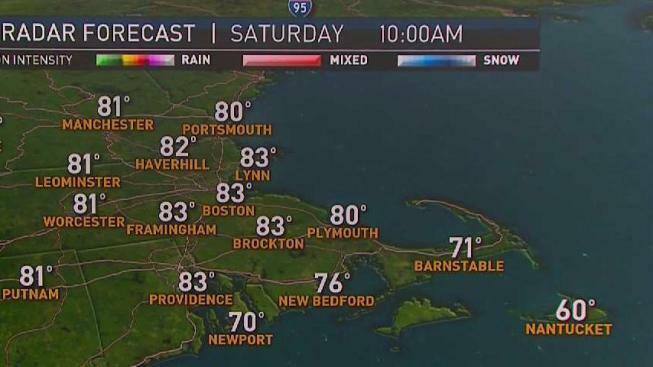 In southern New England, highs will be in the 80s to near 90. In northern New England, the cold front will bring cooler air in the 70s. The real battle zone between those different air masses—central Vermont through central New Hampshire down towards northeastern Massachusetts—will start warm and then dramatically drop later in the day. As that drop happens, expect some scattered showers and thunderstorms. A few may generate torrential rain and damaging wind gusts. The cold front will continue to sag south after that, bringing all of us into a cool east wind on Sunday. Highs as a result will be in the 50s near the coast, with 60s inland. Wind from the east may gust past 30 mph at the beach Sunday with waves building to three to six feet. We’ll also have lots of clouds and periods of generally light showers. The best chance of staying dry is in far northern New England. Monday should be a bit better, with 60s at the coast for highs. We’ll climb closer to 70 inland. It’ll still be mostly cloudy with a few spot showers, but many of us will have lots of dry times. More sunshine and mild air returns after the holiday for the middle of next week.